As has been reported in The Huffington Post (USA), the Sunday Mail (Australia), The Telegraph (UK) and the Daily Mail (UK) Paris Match (France) David Glasheen lost his Queensland Supreme Court case which was bought by the majority shareholder of the company that owns the head lease of Restoration island. He has the right to appeal the judgement, and is seeking pro bono legal advice. Dave's only chance to stop being evicted from his island paradise is to find a buyer who can pay out the majority shareholder of the company that owns the head lease, which would allow Dave to remain on the island as a caretaker. The current lease ends in 2039, but Dave has excellent and long-standing contact with the Kuku Yau People, the traditional owners of the island, who would support a new 99 year lease. They would welcome and support the development of a resort on the island, which would bring much needed employment and investment to the area. David Glasheen and his faithful companion Quassi the dog has been featured around the World, on Channel 9's A Current Affair twice on January 6, 2009 & July 31, 2009, The Today Show Channel 9, The New York Times, Fox News USA, Radio 2GB Sydney, The Sunday Times UK, 60 Minutes Australia, The Sunday Telegraph, The Herald Sun, Faut pas rever on France's TV3, he has even been the basis of a book "Miranda" by the author I.A. Curtis. Restoration Island or “Resto” as she is called by the locals sits just off the east coast of Cape Weymouth, on the tip of Australia’s Cape York. The island is located at Latitude: 12° 37' 0 S, Longitude: 143° 26' 60 E, 1928 km northwest of Brisbane and a few hundred metres from Cape Weymouth and the Iron Range National Park, on Queensland’s Cape York. Restoration Island is fringed by reef and beaches and has unique and safe anchorages for vessels from both the south easterly and north westerly winds. This picturesque and historic island with its tall palm trees swaying in the wind above sugar-white beaches, and surrounded by pristine coral reefs is the epitome of a tropical island paradise. Aptly named “Restoration” Island it naturally conjures up castaway dreams on a tropical isle, the ultimate get-away for rejuvenation of the body and soul. This tiny green oasis floating in the South Pacific is cooled by the winds, and surrounded by wild windswept beaches shaded by swaying coconut palms. The sea, sunshine, the sound of the surf and the cries of the sea birds are your only company. Upon receipt of written expressions of interest (full name, address and contact details). Bona Fide investors will be supplied with a detailed report on the island and the surrounding area, as well as a report on comparable private island developments world-wide. The dictionary defines island as “land surrounded by water”, but no island-lover would ever allow such a commonplace description to detract from the romantic sound of the word and all that it conveys to the imagination. Islands, like emerald yachts on a powdered sapphire sea, are places of magic, for there is something unpredictable about an island. Owning your own island is the dream of many people looking to get away from it all. Surrounded by water the wind, sand, and the occasional sounds of nature, you can sit back and relax without worrying about the everyday problems of land people. If you choose the right island, you can escape the madness of modern society for no more than you'd pay for a really nice big (really-really nice and really-really big!) house on the mainland. There is nothing more exclusive and sought after in the world than having your own private island, it becomes effectively you own little kingdom. From Riccardo Montalban's Fantasy Island to Dr. No's Crab Key, private islands are exactly that - private. Most individuals buy islands for their personal retreat, and dozens of celebrities own their own private islands. An island offers absolute privacy because it is surrounded by water, and in a recent case in Britain Elle McPherson won a judgment against a magazine for invading her privacy because she was on the 'private' island of Mustique in the Caribbean. On the 7th day God stopped making Islands! It’s true though, islands are a limited commodity, and offer an incredible investment as they appreciate rapidly. Demand is a so an important factor. Indeed, the supply-demand balance is perhaps much more significant than for other real estate as one cannot just create another island. Good islands don't come cheap. Islands are like diamonds and are a unique one-of-a-kind investment. Over the last 10 years the price of islands in the Caribbean has increased by up to 300%, that’s over 30% per year, a great investment in any terms. Most Australian private islands are on a 99-year lease. Freehold islands are quite rare, especially in the state of Queensland, because as far back as the 1930’s the Queensland Government recognized the value of the Great Barrier Reef Islands and allowed only a handful to be converted to freehold status. Private islands are extremely rare in Australia, and Queensland in particular, and prices reflect this. 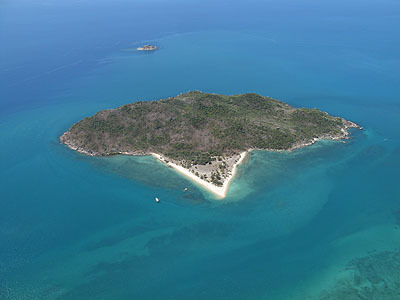 Accessibility is all important on an island, and Restoration Island would have to be one of the most accessible private islands on the Great Barrier Reef. There are daily flights to Lockhart River, and from there a picturesque 40km drive takes you to Cape Weymouth where it is less than 1 kilometre by boat to the island. The island has an all weather anchorage, sheltered during most weather, and accessible at high or low tide. Access to the island from Lockhart River can also be 20 kilometres by boat. The island has immediate proximity to some of the best tourism sites in the world, most notably The Great Barrier Reef. Here is a small sample of the nearby attractions accessible from the island. Portland Roads: The jetty at Portland Roads was built in about 1938/39 to service the gold mining activities at Batavia Goldfield (later called Wenlock) and the Iron Range area. It was 810 feet long to reach the deep water. A tramline ran out to the wharf (60 ft x 30 ft) at the end of the jetty. There was a shed located on the wharf. During WWII this small town was a hive of activity as the Americans used it as a forward base to fight the Japanese. In 1942 the US Army built two 7,000 feet runways and 13 miles of sealed taxiways within 3 months, this is where the existing Lockhart River Airport now stands. Gun turrets and bunkers can still be seen, enshrouded by vegetation in the hills of the town. There are only 8 houses at Portland Roads and another 3 at nearby Cape Weymouth. Chilli Beach: Chilli Beach is wide and long and fringed with palms – a truly magical spot overlooking Restoration Island, ideal for fishing, camping or beachcombing. 4km of dazzling white sand fringed by towering coconut palms right down to the high-water mark, tropical perfection With a fishing hotspot estuary at one end, you can drive it at high tide. Lockhart River: A great trip to this remote aboriginal community famous for its art, a chance to buy art direct from the artists. Diving: Thanks to its remote location and brief dive season, Queensland's Far North, off Cape York Peninsula, is an experience only a few lucky divers get to have with untouched and pristine sections of the Great Barrier Reef, offering unparalleled dive sites.. With water temperatures around a pleasant 23°C to 30°C (73°F to 86°F) snorkelling, swimming and diving are ideal year round. Enjoy crystal clear water and visibility that in parts reaches 70m (230ft) making the snorkelling in untouched coral gardens and diving spectacular for viewing shipwrecks and underwater canyons, coral reefs and a stunning variety of reef fish. Nearby Restoration Island is the Southern Detached Reef which has been voted one of the Top Ten dive sites in the world. This gorgeous reef crowns the remnants of an undersea mountain that has its genesis on the seafloor more than 3,000 feet below, and silver-tip sharks and dogtooth tuna cruise the deep blue. At shallower depths, you'll find giant clams and pufferfishes. Divers will see turtles, reef sharks, eagle rays, pelagic fish and occasional manta rays cruising the walls which encircle Southern Small Detached Reef. These walls, which drop to beyond 100m, are festooned with a spectacular array of corals, large gorgonians, long sea whips, spike soft coral trees and sponges, which provide shelter for hosts of multicoloured reef fish. Gorgonian sea fans bedeck the walls and overhangs. In the relative shallow areas they may grow to over 2 metres in size. Down deep on the ridges at 40 to 50 metres they are like gigantic gardens, arcing out into the currents. They fade away into the shadowy the depths as far as the eye can see. Visibility averages a reliable 60 to 100 feet and often soars to more than 150 feet. Sailing: The island would make an ideal base for sail or motor boats to explore the untouched wilderness of Cape York and the remote and pristine islands of the Great Barrier Reef. Fishing: Game-fishing charters from the island would be ideal with world-class Marlin, Tuna and Swordfish. Or you can join the locals along a deserted beach and enjoy a good book with a long line! Kayaking: The surrounding area with its clear, calm and sheltered waters, many islands and spectacular scenery could become a haven for kayaking, and guests could visit remote uninhabited islands with white sand beaches such as the nearby Forbes Islands. It sounds like a dream trip - a 48-day cruise around the South Pacific. But adventurer Don McIntyre, doesn't like to do things the easy, conventional way. This time he got it into his head to re-enact the epic voyage of Captain William Bligh after the infamous mutiny on the Bounty. Set adrift off Tonga in a boat scarcely larger than a dinghy, Bligh made it all the way to West Timor - some 4000 nautical miles. Don set off in a faithful replica of that longboat, packed with minimal rations and no map. He even short-sheeted himself on toilet paper, little wonder his fellow adventurers were on the verge of their own mutiny for most of the voyage. Above is a picture of the boat when it landed at Restoration Island, with the island's resident David Glasheen beside the boat. Restoration Island or “Resto” as the locals call it is a very beautiful 100 acre volcanic, mainland island surrounded by fringing coral reefs and super-white beaches located in Cape York, 800 kilometers north of Cairns, on Australia’s Great Barrier Reef. Although the island is small (100 acres) and very remote it has an amazing history, and has hosted many different types of celebrities over the years. Russell Crowe, Errol Flynn and Captain William Bligh of Mutiny on the Bounty fame have all visited the island. Today the only resident of the island is David Glasheen who is searching a Girl Friday to share his island, and a joint venture partner to help develop the island. The island’s first European and most famous visitor was the famous Captain Bligh of the Mutiny of the Bounty fame. The mutiny on the Bounty remains one of the best-known stories in the history of seafaring. About being cast adrift in the Bounty’s Longboat by Fletcher Christian, William Bligh managed to sail the tiny craft 4,000 miles over open ocean from Tofua Island in Tonga, to modern-day Indonesia; one of the greatest feats in the annals of maritime history. In the 1990s Australia’s ‘Bush Tucker Man’, Major Les Hiddens featured the island and showed the foods that Bligh and his men would have found when they were living on the island. The story of the Mutiny has been the fodder of Hollywood since 1916, and no fewer the 5 versions of the story have been filmed. The amazing thing is that every actor who played Fletcher Christian in film fell in love with Tahiti, and bought their own private islands! Except Clark Gable. Errol Flynn (1933 version) bought Navy Island, Port Antonio, Jamaica. Marlon Brando (1962 version) most famously became besotted with Tahiti, he married his co-start Tarita Teripea, fathered Simon Teihotu Brando and Cheyenne Brando and purchase his private atoll of Te’tiaroa. Where The Brando Resort is currently being developed by Richard Bailey. Mel Gibson who starred in “The Bounty” (1984 version) and bought his own private island of Mago in the Lau Islands of Fiji in 2004. The British Navy’s reaction to the Mutiny on the Bounty was swift, and a little more than a year after the mutiny, the Admiralty Lords commanded Captain Edwards to set sail in search of the mutineers in HMS Pandora. With eight shipmates, Tahitian women, and some Polynesian men, Christian settled on uninhabited Pitcairn Island, a spot so remote that even Polynesian sailors were uncertain as to its whereabouts. His direct descendants live there to this day, along with many on Norfolk Island. They mutineers burnt and scuttled the Bounty a few weeks after arrival, and the wreck was first discovered by the famed national Geographic photographer Luis Marden. In another Hollywood link to the Bounty story Marden was the advisor for the 1962 version of Mutiny on the Bounty with Marlon Brando. Brando was fascinated by the story of the mutineers and Pitcairn Island. But the fame of the story of the Bounty overshadows the equally epic story of the Pandora and 24 other mutineers who were captured in Tahiti, placed in a cage on the deck of the ship, and eventually shipwrecked not far from Restoration Island. On August 29th, 1791, as the Pandora struck a submerged outcrop of coral and began to take water. The Pandora wreck lay undetected in its coral graveyard almost 200 years. Today HMS Pandora is one of the most significant shipwrecks in the Southern Hemisphere, with immense archaeological significance. In the late 1940s Flynn was sailing the Caribbean on his yacht Zaca when a hurricane blew him ashore on Jamaica. It was love at first sight and Flynn turned the 64 acre (25ha) Navy Island into a resort, and built his private home on a hill overlooking the harbour. The island was also connected to the story of Mutiny on the Bounty. After the mutiny on the Bounty an Admiralty enquiry exonerated Bligh, and he was sent on a second – and this time successful - voyage to collect the breadfruit for the West Indies. On February 5, 1793, Captain Bligh’s ship, The HMS Providence, landed in Jamaica, with a cargo of Breadfruit trees and the were based at Navy Island. Today, the breadfruit tree can be found all over Jamaica and is still used in Caribbean cuisine. In 2009 Errol Flynn’s grandson 34-year-old model/actor Luke Flynn, is planning to shoot “In Like Flynn” which will be loosely based on Flynn’s book “Beam Ends”. The film will depict Flynn’s life before he became and actor, and an internationally renowned celebrity. It will show his adventures as an adventurer, opium smuggler, gambler, street fighter, womanizer, and gold prospector. The film is being produced by independent production company, Wingman Productions in Los Angeles. Image: The M.V. Mustique which Russell Crowe and his wife Danielle visited restoration Island during a honeymoon trip on 19th April, 2003. Russell Crowe and his wife Danielle came to Restoration Island while on their honeymoon in 2003. 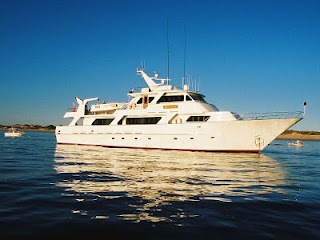 They were travelling up the Great Barrier Reef on an 11 day trip aboard the 110 foot cruiser M.V. Mustique. 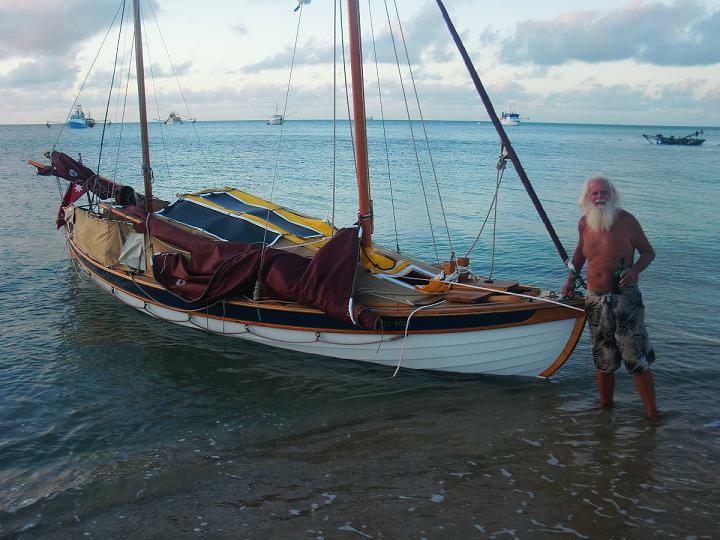 They stopped at Snapper, Lizard, Morris and Forbes islands, the Escape River, Eborac Island at the tip of Cape York Peninsula finishing at Thursday Island, where the couple attended the Anzac Day dawn service on April 25th. Crowe had just finished shooting Peter Weir’s “Master and Commander” which he played the role of 18th century Captain Jack Aubrey. He is known for getting into character and did extensive research for his role. So it’s not surprising that he would have wanted to stop at Restoration because of its association with the Mutiny on the Bounty. 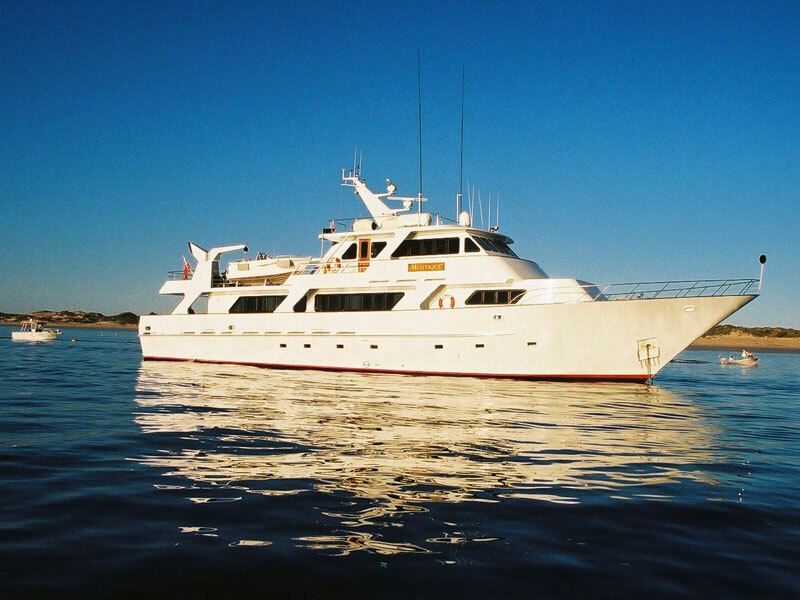 The Captain of the Mustique was formerly the Master of “The Bounty” replica in Sydney Harbour, who met his partner Irene on the boat in 1994-5 when she was the Quartermaster/Hostess. This was the replica created for the 1984 Dino De Laurentis film “The Bounty” starring Mel Gibson and Anthony Hopkins. “Hi, I’m David and this is my girlfriend Irene. We have some guests on our ship, can we bring them over for dinner?” asked the Captain. “You’ve left it a bit late. I don’t have any cold beer, or fresh fish” said Dave. “Don’t worry. We have a boat full, we will cook for you.” replied the Captain. "Great! I will get the fire organised” Said Dave. A short while later the tender for the yacht came over with the Captain, his wife Irene and Russell and Danielle Crowe. While dinner was being prepared they all sat down in front of a fire on the beach. It was a lovely clear night, they all sat on the beach looking at the sunset in the west and watching the stars appear in the crystal-clear skies. Crowe laughed and stated “I’m not much good at either!” but didn’t really tell Dave who he was. It was only during the course of the dinner that Dave caught references to the movie industry, and he still thought at this stage that Crowe might have just been a movie executive. After dinner Danielle was keen to finish a book she had been reading, so went back to the yacht with the crew leaving Dave and Crowe alone on the beach. They relaxed and shared a couple of bottles of Bowen Estate red, which was the first bottle of wine Dave had drunk in six months. “He was just an intelligent, unassuming down-to-earth kind of bloke” said Dave. Crowe was now besotted with Dave’s tranquil and simple life. He explained to Dave that he craved privacy and the island would be an ideal getaway for him. “We discussed how he could get here without being noticed.” Dave now understood that Crowe must have been a celebrity. “I’d be interested in building a donga (hut) on the island” said Crowe. Although Dave thought Crowe was a “nice bloke” he didn’t really know him well enough to agree immediately. 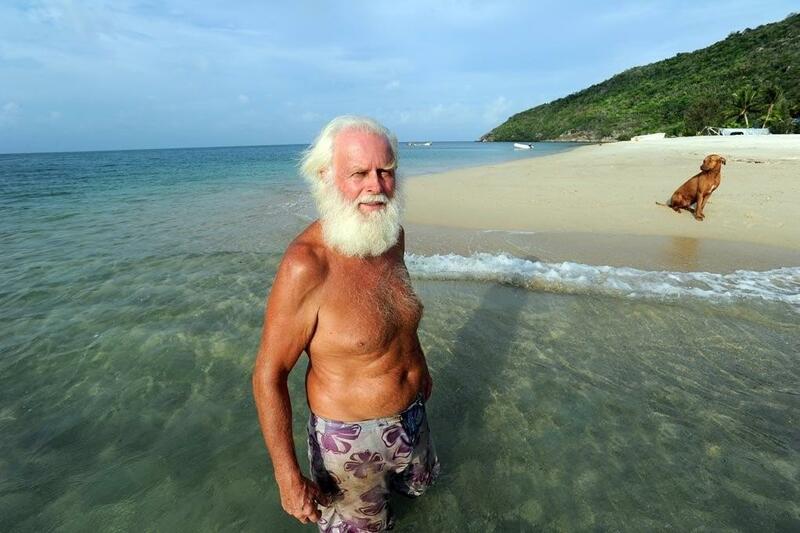 Although Dave is looking for a partner to help develop the island (he envisions a marine research centre/eco-resort). He didn’t really say yes or no, he just wanted time to get to know Crowe better, so Crowe accepted this gracefully. He then asked Dave is he could take a photograph with him. David politely declined stating "My daughters would love to have a photo of you and me together, but isn't that what you came here to escape?" Crowe smiled and admitted ruefully that Dave was right. “He asked for my email address, and said that he would and get in contact with me when he had the time.” said Dave. Dave sent a painting to Crowe, and invited him to his 60th Birthday in August 2003 in Sydney, but Crowe said that he was going to be really busy and probably unable to attend. Crowe titled his first single "I Want to Be Like Marlon Brando", but later admitted that he had never even seen a Brando movie when he wrote and recorded the song. If history is anything to go by, expect Crowe to be the next to reprise the role of Fletcher Christian, and possibly buy his own island. This article is based upon many hours of phone conversations with David Glasheen, and all facts have been confirmed by the participants. In 1980 the 50-year-old Gerald Kingsland placed an advertisement in the classified listings of London “Time Out” Magazine. "Writer seeks 'wife' for year on tropical island." Said the brief listing. David Glasheen is a 65-year-old former businessman from Sydney’s North Shore who traded in his suit for a loincloth after losing most of his money in the stock market crash of 1987. 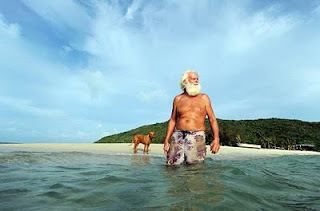 He first visited Restoration Island in 1993, he acquired an interest in the island with his remaining money in 1994, and moved there permanently in 1997 with his girlfriend. But with no hot water, a bath or the mod cons she found it tough and left to return to the city. Since then he has upgraded accommodation on the island, and has lived there happily with his dog Quasi and sporadic visits from Woofers, those from Willing Workers on Organic Farms (WWOOF). In early 2007 I contacted David Glasheen who lives on Restoration Island because I had seen an article about the island, and being an islomaniac wanted to know more about the man who lived on such a famous island. Dave and I got on very well, sharing a common passion of course and over time spoke more and more. We met in person occasionally when he came down to town, and during one of these meetings we discussed how we wanted to find a Girl Friday to share his life, and the island. Dave’s first foray into internet dating started with the help Roni Eyal, a young lady from Israel who came to the island as a Woofer (willing Workers on Organic Farms), on the 19th November 2004. “Unfortunately women don’t come out of ocean, as easily as the internet.” Said Dave wistfully. I told Dave at the time that unless he got some publicity about himself and capitalised on the fact that he was a real-life Robinson Crusoe, and made public the island it would be difficult to attract women. I told him the story of Lucy Irvine and the fame she had achieved, and told Dave she should capitalise on this. However, he was reticent about losing his anonymity at that stage and so we didn’t discuss it for a year or so. Dave would contact me out of the blue from time to time, and eventually he changed his mind, and on the 9th of June, 2008 I wrote a post in my website featuring David’s search for a Girl Friday. The post didn’t attract much attention because at that stage David didn’t want too much publicity. He is a hermit after all, and didn’t want his island identified, and the RSVP profile only used his username Kato9. So although he had put his toes a bit deeper in the waters of the internet, his real name and location still weren’t public. In late December 2008 I was called by Katrina Creer, a journalist from The Sunday Telegraph in Sydney, Australia. She wanted to feature someone who had made a ‘sea-change’ to Port Douglas. I suggested instead that David was a better story but she decided at first it didn’t really fit with what she had planned. Then a week later she called me back and was very excited because she had only glanced at what I sent here and didn’t realise that Dave was looking for a lady. She loved the idea of a story of a modern-day, real life Robinson Crusoe looking for love over the internet. So she rang Dave back and asked him a bit more about this story. “She asked me if I had any responses to the RSVP page, and I said very little” said Dave. “Katrina said you’re already out there on the airwaves, this will just give you some more exposure. And so I agreed to do the story” said Dave. Katrina’s article featuring David and his search for a Girl Friday was published in the Sunday Telegraph on December 28, 2008. Katrina’s article was picked up by media around the world, and David was featured on the Today Show in Australia, The Times of London, USA Today and Several other TV shows from around the world will be featuring David as well, including a major German TV show. Dave was featured on Current Affair, Channel Nine Australia, on Monday January 5th 2009. With all the publicity Dave’s search for love is getting I thought it best to interview Dave and ask pertinent questions other journalists will want to know. This article is based upon many hours of phone conversations with David Glasheen, and all facts have been confirmed by the participants. Q: Why did you decide to live on the island? A: As a child I grew up on the ocean, and always dreamed of living on an island. Q: What is the best thing about living on an island? A: Complete privacy and tranquillity. Q: What is the worst thing about living on an island? A: Not having someone special to share the experiences with. Q: Does it bother you to be called a hermit? A: I suppose I am a hermit, just because I live here on my own. But that’s doesn’t make me unsociable. I see myself as a social hermit, and I’ve played host to all sorts of interesting people from all over the world here. I’m not a hermit by choice, and would really love to find the ideal lady to share the island with. Q: Don’t you miss all the mod cons of living in a city? Q: If you could have a dinner party with three famous people from any time in history who it they be, and why? A: The Dalai Lama, because he represents spirituality, peace, tolerance and love for all people. Obama, because he represents hope and leadership; which we badly need. Osama Bin Laden because is the figurehead of aggression and intolerance. Q: What would you do if you ruled the world? A: I would try to bring about peace, love and tolerance. Q: Tell me about your proudest achievement? A: To be able to experience a little bit of heaven on earth on my own island. I’m the luckiest bloke in the world to live here, and money is immaterial. I am contented and happy, and in the modern-day world that’s a precious thing. Q: The most recent book and movie have you enjoyed? A: Shantaram by Gregory David Roberts. Ice Age III, I see primarily kids movies with my son. Q: What one thing would improve your life? Q: Who would play you in the movie of your life? A: Anthony Hopkins, or if he wasn’t available Russell Crowe. A: Becoming more involved and connected with the people of Cape York, and my friends and family. Q: What three words would best describe the type of woman you are looking for? Q: Dave, are you worried about giving up your privacy to gain publicity so you can find love? A: In the short term yes, but I think it all be worthwhile if I find a special lady.